Our classic woven Light Green leather bracelet with sterling silver barrel clasp is on trend in dark blue. 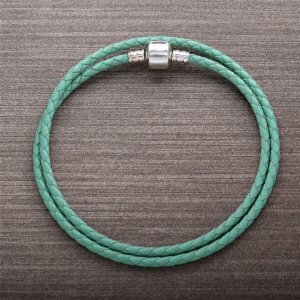 Great for adding a bit of edge to your outf..
Our classic woven Light Green leather bracelet with sterling silver barrel clasp is on trend in dark blue. Great for adding a bit of edge to your outfit, the bracelet can be worn with up to nine Sterling Silver charms. Be the first one write review for the product.